Also check my previous Identity tutorial – Username, Email & Password Policy in Identity Membership in ASP.NET Core. The View does nothing special except for showing the string ‘Hello’ which is returned by the Controller. There is no restriction for invoking the Index Action method at present. Therefore when I ran the project then my browser sent an un-authenticated request to this action. My un-authenticated request was able to invoke this action method and I see the ‘Hello’ message on my browser. 1. I applied the [[Authorize]] attribute to the Index Action, so my un-authenticated request was not able to invoke it. 2. The Identity system redirected me to the Login URL – http://localhost:57149/Account/Login?ReturnUrl=%2F, so that I can log in to authenticate myself. Notice the URL contains the query string variable ‘ReturnUrl’ which contains ‘%2F’. Once I complete my log in procedure then I will be redirected to the URL http://localhost:57149. Note that the ‘%2F’ is an encoded URL which stands for ‘/’. Although /Account/Login is the default Login URL in Identity system, and to where that clients are redirected to when authorization is required. Here I have specified the new login URL as ‘/Authenticate/Login’. Note that this ULR cannot be formed by the routing system. So if you change your routing scheme then you should make sure that you change the Identity Login URL here manually. In order to create a login feature, I need to create a Login class inside the Models folder. 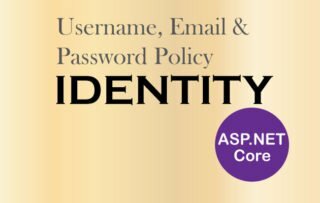 This class 3 properties – Email, Password and ReturnUrl. Email and Password properties are made ‘Required’ fields since User will have to enter both of them in order to do login. The ReturnUrl property will contains the Return URL set by the Identity System. The Identity System redirects to the Login URL which is ‘/Account/Login’, so I need to create ‘Account’ controller with ‘Login’ action method. From there Users can do the log in procedure. The controller class is applied with [Authorize] attribute so that it cannot be invoked by un-authenticated requests. However I have added [AllowAnonymous] attributes to the 2 action methods so that these action methods can be invoked by un-authenticated requests. See that I have added a dependency of UserManager & SignInManager in the constructor so these objects will be provided by the Dependency Injection feature. The UserManager is used to manage Users in Identity system while the SignInManager is used to perform the authentication. Next, I added the GET version of the ‘Login’ action method. I applied the [[AllowAnonymous]] attribute on it so that the GET version of the Login action method does not require authentication. This action has a ‘returnUrl’ whose value is provided from the ‘ReturnUrl’ variable of the query sting by the Model Binding procedure. The Model of Login type is returned by this action method to its default view. Notice I have set the value of the ‘ReturnUrl’ property of the Login class to the value that comes to the action’s parameter. 1. [AllowAnonymous] attribute lets it to be invoked by un-authenticated requests. 2. [ValidateAntiForgeryToken] to prevent cross-site request forgery. I have provided ‘false’ value for the last 3rd and 4th parameters because I don’t want a persistence cookie for a persistence login that will remain even after I close the browser, nor i want to lock on the account when sing in fails. This method returns SignInResult object that contains the result of the sign in procedure. Its ‘Succeeded’ property contains true value if the sign in is successful else returns false. I will login in with this user of mine. If you don’t have any User then you can create it from the URL – ‘/Admin/Create’. 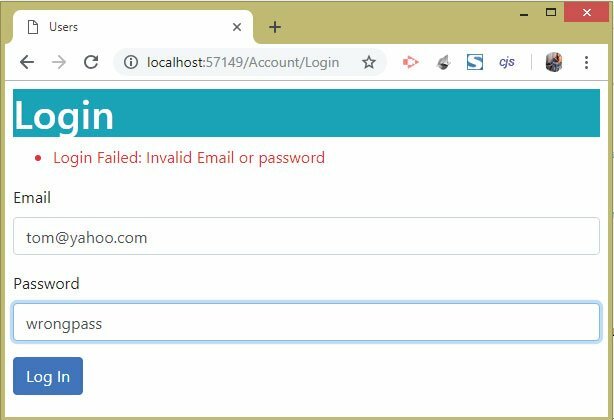 The Logout Action is fairly simple which just uses signInManager.SignOutAsync() to do the signing out of any logged in user from the application. The Logout Action method will be linked from the Home Controller’s Index View only, since after login the user is taken to this View only. 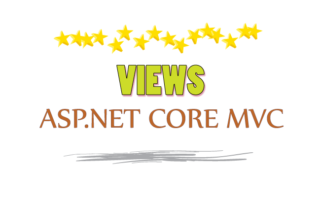 Here, I have used the RazorPageBase class of the Microsoft.AspNetCore.Mvc.Razor namespace. This class User.Identity.IsAuthenticated property gives true if the user is logged in else returns null. I have used it to show my Logout link only when the user is logged in to the application. This cookie is sent to the server at each HTTP Request, like when you open a URL of your application in your browser. 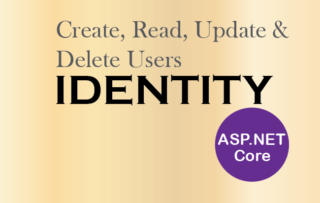 The ASP.NET Core Identity uses this cookie sent by the browser to determine whether the user has been authenticated or not. Note – To logout any user from Identity, simple delete this cookie by selecting this cookie and clicking the ‘X’ sign. 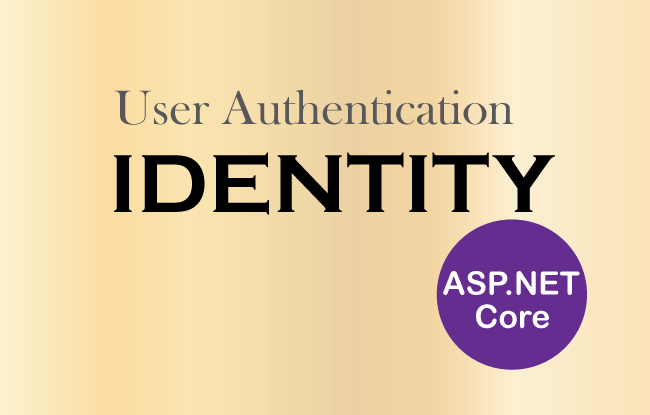 This completes this tutorial on Authenticating Users in Identity and now you are in a position to create your own secured areas in your website, where there will be a need to do login and logout.